Kerastase Fondant Densite is light and creamy conditioner that provides a lifting and plumping care for thin hair lacking in loss of density. Hair is left visibly fuller and brimming with vitality. Kerastase Specifique Bain Vital Dermo Calm 250 ml/ 8.5 fl. Apply a quarter size amount to wet hair, massage from scalp to ends, then rinse. How to Use. Dry and rebellious hair is left feeling soft and supple. Smoothing oil enriched shampoo for dry and rebellious hair. 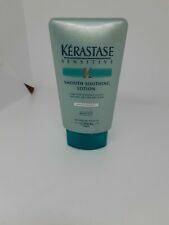 Kerastase Specifique Bain Riche Dermo-Calm 250 ml Sensitive Skin Shampoo. 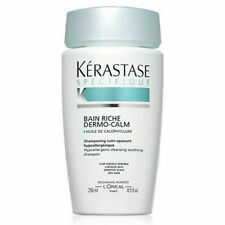 Kerastase Specifique Bain Riche Dermo-Calm 250 ml. Linea prodotti Specifique. Eliminates impurities from the hair and scalp, the hair is softer and shinier. SIZE: 250ml. Apply to wet hair, massage, rinse and repeat. KERASTASE SPECIFIQUE BAIN VITAL DERMO-CALM. It contains Hydra Destress complex to mildly remove impurities from scalp and hair. The fragrance is pleasantly relaxing. Made without silicone. size : 250ml / 8.5fl.oz. KERASTASE SPECIFIQUE BAIN RICHE DERMO-CALM. Kerastase Specifique Bain Riche Dermo-Calm fromSpecifique line is a hypoallergenic gentle soothing shampoo that purifies and treats the sensitive scalp and nourishes dry hair. $KERASTASE Specifique Bain Vital Dermo Calm Shampoo 250ml/8.5oz Kerastase Sensidote Dermo-Calm Bain An innovative shampoo designed to soothe sensitive scalps, Specifique Dermo-Calm Bain Vital by Kerastase provides your hair with a gentle yet effective cleanse. Working to calm irritation and prevent itching, this calming shampoo is perfect for hair that's in need of some TLC. Created to keep the hair moisturised, shiny and super soft, Specifique Dermo-Calm Bain Vital is a luxurious shampoo that will leave you feeling both refreshed and rejuvenated. A revolutionary renewing & repairing shampoo. Features a unique jelly-like formula that repairs hair fiber while shampooing. Renews split ends & brittle strands by enveloping hair. Leaves hair smooth shiny hydrated revitalized & healthy looking. A creamy hypoallergenic soothing shampoo. Blended with Glycerol to relax & soften the scalp. Jean Paul Gaultier. Formulated with Calophyllum Oil to calm irritation. Leaves hair supple & nourished. Hair Care by Kerastase. Jean Paul Gaultier. Creates a silky & luxurious lather to gently cleanse hair without overloading. Hair Care by Kerastase. Skin Ceuticals. Provides deep hydration & rich nutrition. Leaves hair soft & smooth & shiny. Specifique Bain Riche Dermo-calm 250ml. Bath rich Kerastase Dermo-Calm specific 250ml. A calm scalp. Distribute on wet hair, wash your hands flat and rinse. Soft and flexible, easy to detangle hair. Can be used daily. The A.H.A. shampoo enriched with Vitamin. We are an officially authorised Kerastase Salon. Bain Vital. Copy Right 2017 All Right Reserved by HairSkinBeauty. Unwanted - Not Wanted. Quick view Want to enhance your image and highlight your beauty?. Then the Shampoo Dermo-calm Kerastase will help you to achieve your goals! Want to enhance your image and highlight your beauty?. Then theShampoo Dermo-calm Kerastase will help you to achieve your goals! Quick view Want to enhance your image and highlight your beauty?. Want to enhance your image and highlight your beauty?. Fly Repellents. Capacity: 250 ml. Gender: Unisex. Xenon Kits. warranty . ico policy 2 year. Bath Vital Dermo-Calm Kerastas specific 250 m. A calm scalp. Distribute on wet hair, wash your hands flat and rinse. Can be used daily. Vitamin shampoo to the A.H.A. Hydra-Destress complex. Category Hair Care. Product Details. Declaration Notices: on parcels cannot be declared at a lower value. All orders will be declared at cost price. We are an officially authorised Kerastase Salon. Bain Riche. Copy Right 2017 All Right Reserved by HairSkinBeauty. Unwanted - Not Wanted.